This giveaway is now CLOSED. Thanks so much to our wonderful sponsor Nano Style Jewelry! We look forward to working with you again! The winner is: Ferriz Remember: There are great giveaways active on the upper right hand side of the page! Ascending Butterfly has a very simple mission statement 'To Inspire and Be Inspired' and this site was founded on inspiration, gratitude and empowerment. With breathing affirmational meditation excercises and ways to make each day better. It's incredibly important for me to find ways to remain inspired, to connect with the spirit within. I consider myself a person of Faith, and I derive a lot of inspiration from various religions, not just one. It's the different ways Faith is expressed in various religions that fascinate me. Fundamentally, the core of what we believe is the same, it's just the way the Faith is expressed and how that sometimes differs. I've always loved the practice of Buddhism, there is something incredibly grounding and centering about it, the meditations, the beauty of the altars, many with beautiful flowers and lit incense that serve as an almost perfumed prayer to the heavens in and of themselves. When I look at Buddha's they represent peace to me. An inner peace that reminds us to be still, that change comes from within. It's about way more than 'Zen Decor' for me. I've often worn jewelry throughout the years that served me as 'touchstones' of sorts, jewelry that when I wear it, I feel more calm or sometimes even more confident, and I have recently added a piece to my collection that I'd like to share more about. NanoStyle’s contemporary jewelry collections present an exquisite range of onyx and cubic zirconia jewelry collections interconnecting faiths and beliefs through the power of adornment. NanoStyle pendants are made using a unique imprint technology with outstanding visual impact coupled with the flawless CZ stone to bring everlasting beauty to your expression of faith, belief or ideas. I believe that words are extremey powerful. In different times people wore amulets, some with symbols, other's with words on them for protection, wealth and more. Think of Nano Jewelry as modern amulets, allowing you to carry reminders of love, protection, faith or strength with you. Isn't the Metta Prayer beautiful? Imagine how much more peace filled this planet would be if everyone recited this prayer daily? Or said the words as affirmations or meditations if you don't want to call it a prayer. Ƹ̵̡Ӝ̵̨̄Ʒ - Fox Tail-Silver-50cm - 50cm 925 Sterling Silver Foxtail with black finish 2.1mm Chain. This is recommended as an upgrade for men's Nano Jewelry, but I don't like flimsy chains, and chose to upgrade to this necklace and I absolutely love it. I honestly have nothing but good things to say about Nano, and this necklace! I have worn it literally almost daily since I've received it, and I'm always stopped by someone who asks about it. It's definitely a 'touchstone' piece for me. The Onyx touches your skin on the underside of the pendant, Onyx is thought to increase regeneration, happiness, intuition and one's instincts. It aids in changing bad habits and is a strength-giving stone, good for athletes or people under extreme mental and emotional stress. It brings balance to mind or body as well as strength of mind. It can help you approach a lesson or task with greater self-confidence. It is highly recommended that Onyx be used in conjunction with pearls and diamonds to increase their own metaphysical qualities. (And as Diamond is my birthstone, I definitely love the idea of combining Onyx with Diamonds!). Since antiquity, Onyx has been known to actually be used as protection against black magic, as well as defensive magic when negativity is directed toward you. Whether you believe in the meta physical properties of gemstones or not, this is a striking piece and certainly a thoughtful gift! They offer Free Gifts With Every Purchase including a presentation jewelry box for the item, a stylish keychain and Magnifying Glass. 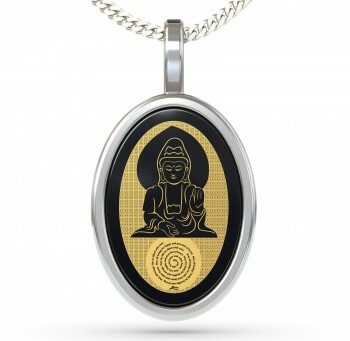 There are styles which reflect Jewish, Kabbalah, Buddhist, and Christian Faiths, as well as secular styles, zodiac pendants, love pendants and more. There is literally something for everyone on your shopping list if you are looking into Holiday gift ideas (the holidays are certainly closer than you think! ), and I know you are going to be tempted to pick up something for yourself too. Ƹ̵̡Ӝ̵̨̄Ʒ - WIN IT! - Ascending Butterfly and our friends at Nano Style Jewlelry would like to give 1 lucky winner a $50 Gift Certificate to Nano Style Jewelry! Don't you just ♥ Nano Style Jewelry? I know I do! I am a public follower.. I follow AB on facebook as wendy wallach-zephier. i love the Capricorn ♑ Zirconia Pendant! love the color too. I follow your blog. The Rose on cubic zirconia pendant looks very nice! I follow @NanoStyleJewel on Twitter under the username likwan. I tweeted the requested message on Twitter at https://twitter.com/#!/likwan/status/122595975515738112. I follow Nano Jewelry on Facebook and let them know you sent me at https://www.facebook.com/permalink.php?story_fbid=260183610689653&id=184232914951390. I follow on GFC (elysesw) and just adore this pendant.